Autumn in Austin means opening the windows and enjoying the fresh air, soaking in the oh-so-comfy temperatures in between the heat of summer and chill of winter, and indulging in those beloved seasonal festivities. Pumpkin is the flavor of fall, and in Austin there are plenty of places to get your fix of the orange goodness. Enjoy an autumn breakfast of pumpkin or pumpkin-cinnamon roll pancakes at Kerbey Lane Café. The pumpkin latte and local hospitality at Stinson&apos;s Bistro will make you forget about those national coffee chain&apos;s offerings, while pumpkin empanadas can only be found at La Mexicana Bakery. If you crave something seasonal and sweet, Amy&apos;s Ice Cream scoops up your choice of pumpkin, pumpkin cheesecake, pumpkin custard, pumpkin pie and pumpkin praline swirl. Heaven in a cone. Or toast the lovely weather with a pumpkin beer at Black Star Co-Op Pub or Hopfields. The cooler fall weather also makes Austin a great place to enjoy time outdoors. 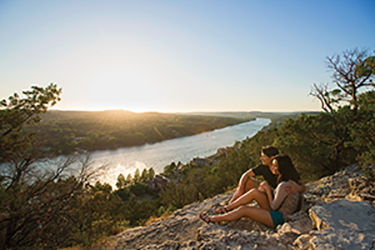 Visit Mount Bonnell to get a bird&apos;s eye view of the city. Go to Zilker Park and take a ride on the Zilker Zephyr miniature train. Dive into the Dino Pit at the Austin Nature and Science Center. Take in the fall foliage in a canoe around Lady Bird Lake (Town Lake) and see a natural palette of color at the Lady Bird Johnson Wildflower Center. Fall is also a fabulous time to celebrate life, friends and family (like we really need another reason!). Lose yourself in the corn maze during the Fall Festival at Barton Hill Farms and take a pumpkin home to carve. Watch Highland games, listen to Irish, Scottish and Breton music and learn the Celtic dances during the Austin Celtic Festival in October. Celebrate the pizza pie during the Home Slice Annual Carnival O&apos;Pizza in November. For even more fall celebrations, check out our events calendar.